Bora Bora Snorkeling is probably not the first thing you think of when you consider going to Bora Bora. Beautiful beaches and the color of the water are more likely thoughts. We often can find pictures of Bora Bora's famous lagoon. The water is incredible shades of blue and green, and the photos are so vivid that they seem as if they were "touched up" and could not be real. To me, however, the life hidden underneath that lagoon is even more beautiful. The water is filled with coral and tropical fish, so colorful that even very few professional photos I have seen can capture how amazing it is. 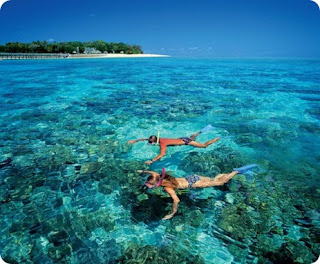 Snorkeling allows anyone and everyone to see this world underneath the lagoon with crystal clarity. You don't have know how to scuba dive - you don't even have to be a great swimmer! 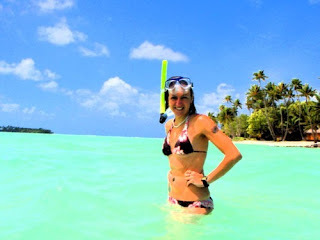 Bora Bora Snorkeling Now, many of you may have been to the Caribbean Sea and snorkeled there. I have been there, also, and to several different islands. I think the Caribbean is wonderful and each island has a unique beauty. However, the experience under the water in the South Pacific makes the Caribbean look like a mud puddle. That is how much different it is in Bora Bora! Bora Bora Snorkeling When I saw how many more bright colors there were in these coral reefs, and how many more different types of tropical fish there seemed to be, I asked someone about it. They gave me some outlandish numbers for the amount of species there are in the South Pacific as compared with the Caribbean. I checked on it, though, and they were right! The Caribbean has approximately 50 species of coral. The Indo-Pacific (which includes the South Pacific) has over 800 species of coral and over 1500 species of fish! Another reason for the difference are that "soft corals" have the really bright colors and that is what there is a lot of in Bora Bora. When I was snorkeling in Aruba, (southern Caribbean) I asked why the coral was not colorful and I was told that is was hard coral, or rock coral. It had interesting formations, but it is colored like rocks. Something else that struck me about Aruba was that as I got into deeper water, the waves became very overpowering and it got a little scary! I had to go back toward shore. That memory touches on another very important thing to remember about Bora Bora. It is ringed by the big coral reef and everything inside of that is the calm waters of a lagoon. The waves break outside the coral ring, so you feel much more protected. Within the lagoon there will be places with no coral where it is good to just swim. There will also be places where there are coral "gardens", or several large clusters of coral in relatively shallow water. In places like this, you can basically just stick your face in the water with a mask and snorkel and see the coral and fish. Without any waves beating on you, this is very easy for anyone of any age or ability. You don't even have to swim! If you can, (ask your guide or your hotel) try to find a current in the water coming in from the reef. Paddle against it toward the reef as far as you are comfortable, and then turn around. Put your arms out and put your mask and snorkel in the water and let the current take you all the way back to the shallows. It is the best feeling! You just float along and watch the magic world below you.